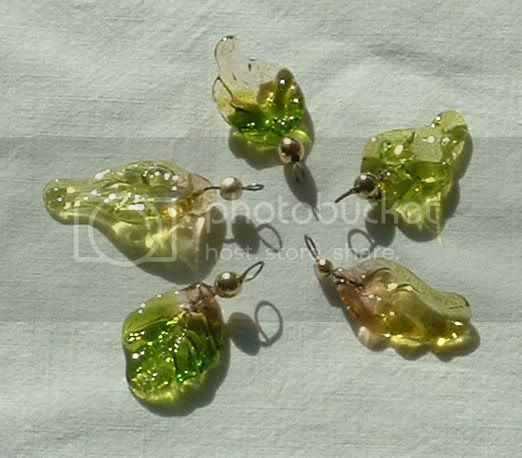 small off mandrel leaves - Page 2 - Lampwork Etc. My pics ended up in the gallery section under leaves.........what a day ! ! ! Thanks for the Tut, Bobby! I LOVE your leaves...they are soooooooooo pretty! I'm going to have to give this a try. Thanks for sharing! I tried some leaves; I put a photo in the Hot Head gallery, but here they are again. Thanks for the tutorial--it was a LOT of fun! WOW ! ! ! Those are cool. It's great to see other leaves. Thank You Bobby!~ I have been so dissatisfied with all my leaves. These are just wonderful and I can't wait to try them. It really has me thinking of all sorts of other avenues to use the technique. Thanks so much for posting this. Hi Bobby...wonderful tutorial - am definitely going to try it sometime. One question - in picture #1 where the wire is shown on the mandrel, what kind of wire is holding it on, or is all of the wire sterling silver? As I understand it, the wire stays in place and becomes an embedded headpin? Oh, Gail..thanks for asking that! I wondered the same thing...does the wire then become the headpin? I thought I read that the wire is re-used, so I'm not sure. The sterling silver wire is the one you put the glass on and the other wire is the one that keeps the sterling silver wire on the mandrell. The sterling silver wire gets to hot to hold and is easier to push into the glass with the stiffness of the mandrell. I just reuse the mandrell and the scrap wire after I get the leaves out of the kiln. I used to just hold the sterling silver wire with tweezers but it wasn't safe. With the silver wire wrapped onto the mandrell you also have a handle to place in the kiln without getting your fingers hot. Somehow our pop upblocker has something to do with the Ctrl button. I don't even want to know how it works.............just let me get what I need out of the computer and I'm o.k..................well sometimes ! ! ! This is too funny...........Norman fixed a problem for me in the uploading of a pic in the tutorial section and then said the computer was all mine. Well I thought I was adding to my tutorial and finished everything and went to see how it loaded...........guess what ? ? ? He had gone to the Gallery section..............You just can't get good help these days was his answer to my request of where in the world is my post ! ! ! So could someone tell me how to get this post sent back to the tutorials. So.........here are the pictures that were supposed to be here a few days ago ! ! ! Bobby, one thing I am finding is a problem is that as the leaves cool, they sometimes sheer off right below the wire, in a diagonal line. I don't have a kiln yet, so I am having to put the leaves in a fiber blanket to cool. Is that the trouble or am I getting too much glass at the end of the leaf? I'm thinking that it is the fiber blanket. They are cooling to fast since they break off at the wire. It's like a bead that breaks off along the mandrel. The mandrel is taking out all the heat. Not sure how to keep them hot enough without a kiln. My largest leaf is 45x30mm so the amount of glass size is not a problem. Thank you for all of the work that you put into this, it is great. I glanced at this tut briefly when it first went up, but I just *got* it now - sterling silver wire!!! That is so cool. This is the same way I do my off-mandrel stuff, except I form the gather on the end of the rod, press with leaf press or whatever, and pull slightly to start to separate from the rod. Take warmed tweezers, grab end of leaf farthest from rod and fire-cut the leaf from the rod. Then let the end of the leaf you've just separated ball up and insert slightly pre-heated wire into that tiny balled-up place in the leaf "vein" and VOILE, pop it in the kiln "as is" no mandrel needed. I use copper wire to do this all the time. Lea...........that is just too cool. on wiring up the mandrels. ...you'll save lots of time and aggravation that way! Hi Bobby, Just wanted to tell you I tried your very cool tutorial tonight for the first time. I was lazy so just tried sticking copper wire into the end of the burned off rod. The first one, a huge um....shape, can't call it a leaf really, went well. The second, a small cube wouldn't grab the copper. I finally put it on a mandrel and said "Now what???" Then I remembered, you did it with a mandrel to begin with, (duh!) so pulled it back off the mandrel with pliers, and managed to reinsert the copper wire. By that time the cube has lost most of it's shape. Pretty hard to marver a cube attached to a piece of 20 gauge copper wire LOL! But this was fun and has me thinking of what other fun shapes I could make. I may try using high temp wire since it's stiffer until I get it down pat. 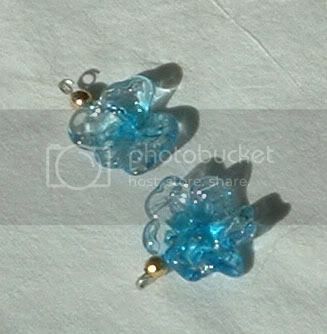 Then I'll use nice Sterling Silver wire. Thanks Angela...............I love the process you are going through.....and.......you are having way too much fun ! ! ! I still love to put things on the end of a wire. I have a litle sig brass piece that I press into a circle of glass and use them on finished pieces. Re-hi, I was reminded while doing this of some peeps used shaped copper as presses. Just like your brass sig! Now I'm going to have to make one. Big GRIN! Wait! I have some brass strips of copper that I bought at the Hobby store for practically pennies. Wonder if I could use that? Hm....Thanks for another idea! where is that UPS man? oiy, I got two leaves in the kiln, and the third, I could not get the wire to stay in it. It finally broke into about 10 pieces and is now decorating my work bench. lol. I was going to try a glass loop, but I've never done that before either. Then the mosquitos starting dining on my scalp. So I think I'll go watch tv instead. Some day I'll have a studio and won't have to work in the garage!! That is the best ever. Thank you for showing this to us. Awesome and more. You live in a world of money. Money means choices. No money, no choices. Welcome to reality. Thanks for the tutorial. I have made similar leaves and let them cool in fiber blanket and annealed them later but I usually have a high breakage rate in the fiber blanket. By putting the silver wire on the mandrel and putting it directly in the kiln I should have less breakage. I love the tweezers you modified, I'll try that trick, too! This is where I learned to make my headpins. Great tutorial! Thanks Bobby! Oh, I wish it wasn't so late! I want to go to my studio and make leaf headpins. I'm on a leaf kick right now and these are just awesome! I didn't have the patience to modify any tweezers, but instead used my jewellery making round nose pliers to mark my leaves - worked well!